TheRustedChain - The Blog: Groovin'. It bugs me when my blog sits for several days with no updates... but that just means I'm super busy. In the past week, I've cried happy twice, when I was reminded of how blessed I am. That's a good place to be - crying happy. I hope I remember that feeling next time I'm down. At the beginning of the month, just before my birthday, I started exercising. I've been doing two-fers - One workout in the morning, and then a 2 mile walk with The Man in the evenings. 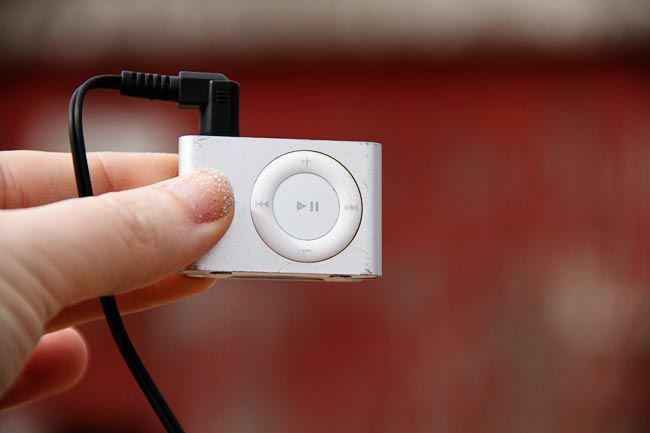 In the evenings The Man and I talk the whole time, but in the mornings I take this little beauty - iPod Shuffle. I LOVE to be surprised. I really do. So I kind of love that I never know what song is coming up next on this. I love that there's no screen. My taste is music is funky. Here are a few of the artists on here. If you don't know who some of them are, I dare you to look them up on itunes or youtube. I think you'll be pleasantly surprised! In addition to working out twice a day, I've cut most of my portion sizes in about half. One of the great things about being on a dirt road? You can sing as loud as you want with your ipod and no one is around to hear. Can't go on without my music. That's all there is to it. As for you gaining a pound? You might have cut your calories too much. If your body thinks you're trying to starve it, it holds on to whatever it can. That being said, why would you want to lose weight and mess with perfection? I was not familiar with these current artists (link below) until I stumbled upon this lady's blog and playlist. I love her playlist and listen to it frequently, so rather than try to type out artists names, I'm sharing the link to her playlist. Maybe as inspiration for you, so you could create a playlist of your own favorites for us as well. PS gaining weight despite the activity is my story too, but it can be 5lbs....just not fair and very discouraging...those are healthier pounds I tell myself. Gary Allan is my favorite. I just found your blog recently, just ordered one of your fabulous necklaces and it's almost Friday. Whoo hoo! Life is good. Fun! I love the glitter polish too! I like to be surprised too. Yes I haven't heard a chunk of those! I will be looking them up. Thank you. I love listening to music from back in MY day. ha! The 80's if you will All dance & freestyle (club) or I just switch it to random and I'm always pleasantly surprised. Miley I love her! No laughing here! Happy day! I love my little Shuffle too! I have a very eclectic selection on mine as well, and in fact, some of yours are on my playlist too. My newest favorite is 'Pumped Up Kicks' by Free The People. Can't get enough of it lately. I just looked up on my phone and apparently some of my favorites are Cee Lo Green (the cleaner stuff), Sara Bareilles, pentatonix, the Pierces, and Sister Hazel! I have a very eclectic style too. I know I listen too a lot of Jem, Imogine Heap, and Florence + the Machine! And of course all the people you mentioned. See music is essential to me day by day!!! Loves ~ your lil sis. Oh forgot to mention, keep up the good work!! I'm so happy you are working out and that you actually polished your nails!! I got the polishing down, guess I should try to be like my big sis and work out too huh? My newest song that I love is "Somebody I Used to Know" by Gotye. Love it! Also for Lisa above - it is Foster the People "Pumped Up Kicks" - just in case you were going to look for that one. That is an excellent choice too! @Beth K yes that Gotye song rocks. You should check out the Pentatonix cover of it on YouTube. It's soo good!! Oh gosh! That whole thing of cutting back and exercising only to gain a pound....is just like me. I'm lucky that way. That is quite an eclectic group of singers! My favorite group is Hootie and the Blowfish. I will always be their #1 fan! i'm laughing so hard at you right now! you crack me up! !